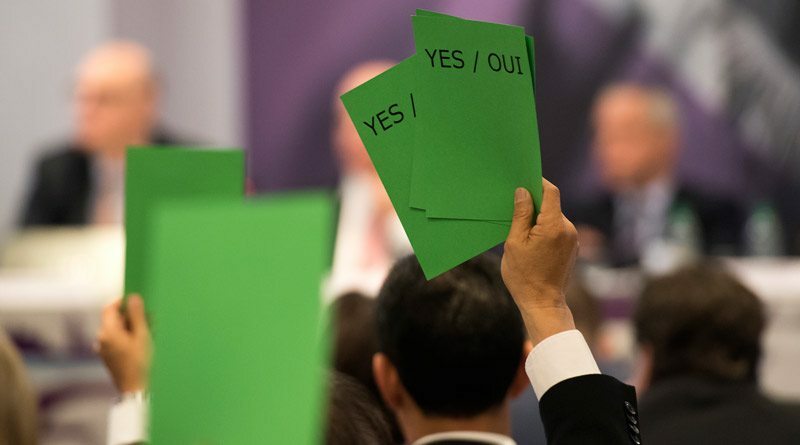 Olympic qualification and quota distribution were key areas of debate during three sessions attended yesterday by national delegates ahead of today’s vote at the FEI General Assembly on the system for the Tokyo 2020 Olympic Games. FEI President Ingmar De Vos spoke on how the distribution of quota places will provide great opportunities to qualify for the Olympics. Delegates representing 106 National Federations (63 on-site and 43 by proxy) joined in the debate on the topic, including clarification on the final deadline for horse/rider combinations to achieve their Minimum Eligibility Requirements. This was originally set for May 18, 2020, but the proposal is now to move this to five weeks before the final sports entry dates across all three Olympic disciplines. The earlier session had focused on rules revisions, with the discipline-specific proposals for rule changes discussed at length. Under Jumping, the proposed rules for the CSI Invitation System will be voted on unchanged, despite a last-minute call from the European Equestrian Federation to revise the proposal. This will be voted on separately tomorrow and not en bloc with the rest of the Jumping rules revisions. The phased banning of hind boots for Jumping over three years, starting with competitions for ponies and children in 2019, generated considerable discussion. It was agreed that this proposal would be voted on separately and not en bloc with the rest of the Jumping rules revisions. If the phased introduction is not approved tomorrow, there will be a second vote on the new proposal to implement this across all levels from January 1, 2021. The proposal to implement a HiLo drop score for Dressage has been withdrawn, and the Dressage Judges Working Group will now look at a testing plan for 2018 to trial the HiLo drop score and other proposals, including those from the Italian and Norwegian National Federations. Other changes made during yesterday’s rules session were the withdrawal of the proposal to introduce a minimum weight for junior and young rider events in Endurance. National Federations will vote on the proposal to reduce the minimum weight from 75kgs to 70kgs in Championships, and 3, 4 and 5* CEIs. The day’s first session provided a detailed update of the activity and plans of the Officials Working Group, based on the 13 recommendations presented at the 2017 FEI Sports Forum. A key milestone is the completion of The Officials Code of Conduct which will now be voted on as part of the FEI General Regulations in today’s General Assembly. Other key achievements include the creation of the FEI Officials Development Fund to assist officials, where needed, to travel and work internationally to gain vital experience, and the extensive e-learning opportunities now available via FEI Campus.